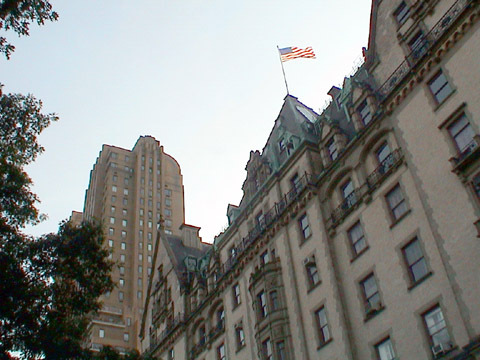 The city's most legendary apartment building, the Dakota is a massive, fortress-like building with a large center courtyard and very large apartments with very high ceilings. The building exudes solidity as well it should since its bottom walls are 28 inches thick, but its profusion of architectural elements and pale yellow brickwork that contrasts with dark brown masonry at the corners produce a lively and graceful appearance of considerable visual interest because of the mix of gables, arches, balconies, oriel windows, dormers, finials and other ornamentation including a flagpole at the top of its park facade. When it was built in 1884, it towered over the Upper West Side and was an immediate success with all its apartments rented on opening day. Its developer, Edward Severin Clark, an heir to a sewing machine fortune, died two years before it opened. The building's name allegedly reflected the fact that the building was so far removed from the city's established luxury residential areas that it might as well be in the Dakota territory. Its 72nd Street façade, indeed, has an image of a Native American carved on its façade. 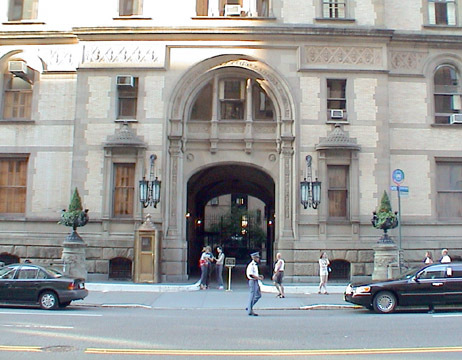 Designed by Henry J. Hardenbergh, who would later design the Plaza Hotel (see The City Review article), the building had tennis courts and a croquet field on the adjoining 175-foot-long lot on West 72nd Street that was later developed after World War II as a separate apartment building. 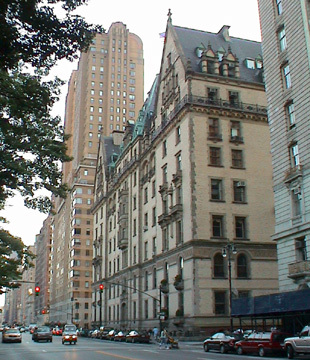 Many of residents of its cooperative apartments have been celebrities including John Lennon, the Beatle who was slain in 1980, Leonard Bernstein, the composer and conductor, Lauren Bacall, the actress, Judy Garland, the singer, William Inge, the playwright, Jo Mielziner, the stage designer, and Rex Reed, the columnist. 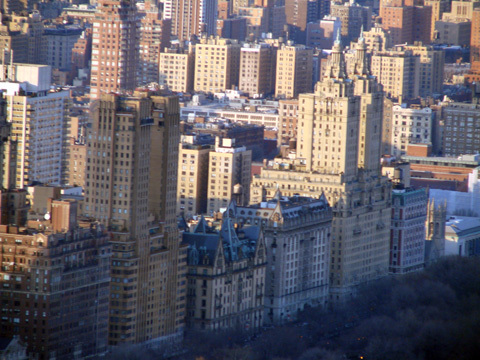 In his superb book, "Upper West Side Story, a History and Guide" (Abbeville Press, 1989), Peter Salwen noted that "The early tenants included the piano manufacturer Theodor Steinway and his friend the music publisher Gustave Schirmer, who liked to fill his salon with such brilliant guests as Mark Twain, William Dean Howells, Herman Melville and Peter Ilyich Tchaikowsky, who came to town in 1891 to donduct the opening night concert at Carnegie Hall, (A charming and extremely unreliable anecdote has the bewildered Tchaikowsky mistaking the Dakota for his host's private home - and Central Park for its garden - and grumbling afterward, 'No wonder we composers are so poor!'" 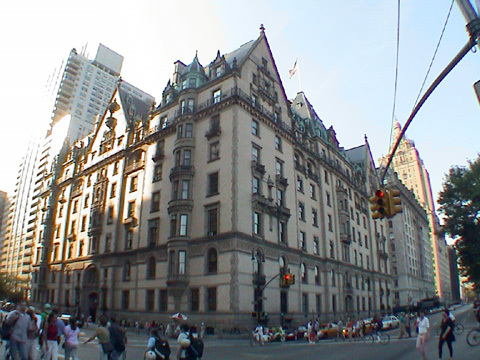 "The Dakota," Elizabeth Hawes wrote in her excellent book, "New York, New York, How the Apartment House Transformed the Life of the City (1869-1930)," (An Owl Book, Henry Holt and Company, 1993), "was a daring building and a daring venture. Although its situation seemed enviable - the peace and quiet, the unobstructed light, the country air, the boundless vista - many New Yorkers thought the view to a vast greensward was a lonely prospect. Others condemned the intrusion of a bulky nine-story silhouette into the precious arcadian landscape of the park. There was, in fact, no other significant shape on the western horizon. The Upper West Side was still a patchwork of small sleepy settlements and vacant lots, interrupted here and there by a country house, an inn, an asylum or a saloon. In 1880, the Sixth Avenue Elevated had been extended up Ninth Avenue to 155th Street, which Clark hoped would spur development in the area. That year, Riverside Drive had been officially opened too.The most daring aspect of Clark's scheme was the extravagance of his building. Behind a façade described as Brewery Brick Victorian neo-Gothic Eclectic, the building was shaped like a huge hollow square, with a large open courtyard, 55 by 90 feet, planned as a carriage drive at center, and separate entryways to its apartments at the corners. Inside, the building was immense and contained 65 suites and 623 rooms in all.The largest room was the public dining room on the ground floor, which was fashioned after an example in an English manor house, with a baronial fifteen-foot fireplace, an inlaid marble floor, and an elaborately carved, quartered-oak ceiling. Adjacent was a smaller private dining room, fitted with mahogany and large beveled-glass windows, and a ladies' reception room, which featured a frieze of clematis painted by the famous Greatorex sisters." Because elevators were quite new at the time and as was the concept of apartment living for the well-to-do, the eighth and ninth floors of the building were originally used for servants' quarters and laundry and storage rooms, although they would eventually be converted to apartments, and the tenth floor included a roof garden and a children's playroom. 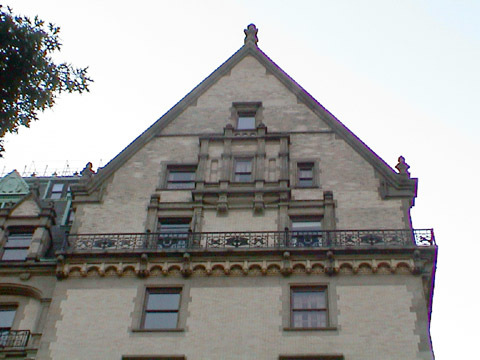 The 93-unit building's Victorian and Gothic architectural details and ambiance were featured in the popular spooky movie, "Rosemary's Baby," but it is famed more now for its spectacular apartments and famous residents. There is a subway stop at the corner. Councilwoman Gail Brewer has written letters to Mayor Bloomberg and Police Commissioner Ray Kelly asking them to restrain tour buses from idling in residential neighborhoods such as Central Park West and 72nd Street where some tour buses stop to let tourists "gawk at the Dakota and the spot where John Lennon was fatally shot by Mark David Chapman in 1980," according to an May 24, 2010 article by Avi at the Westside Independent. An article by Peter Lattman and Christine Haughney in the February 2, 2011 edition of The New York Times reported on a racial discrimination and defamation suit brought against the building by Alphonse Fletcher Jr., a former president of its board of directors. Mr. Fletcher, 45, a prominent Wall Street investor, according to the article, has lived in the building since 1992 and filed the lawsuit after the board denied his application to buy an adjacent unit to accommodate his family. The lawsuit’s allegations include claims that board members made ethnic slurs against prospective residents, including describing one couple as part of the “Jewish mafia” and suggesting that a Hispanic applicant was interested in a first-floor apartment so that he could more easily buy drugs on the street. The applicant, who was rejected, was married to a “prominent financially well-qualified white woman,” according to the suit, and though neither is named, the timing and circumstances suggest that it was Antonio Banderas. "The suit accuses the board of several other instances of treating minorities unfairly," the article continued, "including repeatedly denying another black owner - the singer Roberta Flack - permission to install a new bathtub and then joking about it. Mr. Fletcher also accuses the board of self-dealing: shortly after his request was denied last year, a member of the board who lives on the same floor put her own apartment up for sale, offering it as a package deal with the apartment Mr. Fletcher wanted to buy. “Although such conduct by a co-op board on the Upper West Side of Manhattan at the beginning of the 21st century may seem surprising, this behavior was consistent with the defendants’ extensive pattern of hostility toward nonwhite residents of the building,” said the lawsuit, which was filed on Tuesday in State Supreme Court in Manhattan. "Mr. Fletcher, who is known as Buddy, declined to comment beyond the accusations in his suit. He grew up in Waterford, Conn., and he and his two younger brothers all earned their undergraduate degrees from Harvard. Geoffrey Fletcher, the youngest, won an Academy Award last year for his screenplay for the movie “Precious.” Todd Fletcher is an accomplished composer. In 1991, Alphonse Fletcher, then 25, sued Kidder, Peabody & Company, his employer, accusing the Wall Street bank of paying him only half of the $5 million in annual compensation that he said he was due. He claimed the bank considered the amount 'simply too much money to pay a young black man.' An arbitration panel eventually awarded Mr. Fletcher $1.3 million. Mr. Fletcher founded Fletcher Asset Management in 1991 and set up an office on the 48th floor of the General Motors Building with commanding views of Central Park. As a privately held firm, it is not required to disclose its assets, but according to an investor presentation, its flagship arbitrage fund has claimed an average return of 8 percent a year since 1997," the article said. Mr. Fletcher currently lives in an eight-room, 2,600-square-foot apartment with three bedrooms, three and a half baths, two maids rooms and Central Park views, according to an old sales listing kept by Michele Kleier of the brokerage firm Gumley Haft Kleier. "When Mr. Fletcher tried to buy another apartment for his mother in 2002," the article continued, "the building approved the deal on condition that no one else ever stay in her apartment, even overnight, without board approval, a requirement that the suit said had never been imposed on the unit before. Mr. Fletcher decided to sue because he said he had been blocked from buying a neighboring two-bedroom apartment he planned to use to accommodate his growing family; he is married and has a 2-year-old daughter. He signed a contract to buy the unit for $5.7 million, without a mortgage, from the estate of its former owner, Ruth Proskauer Smith. Mr. Fletcher said that the board began questioning his finances, and that it unfairly concluded he was overleveraged with business loans even though he provided documentation that his net worth was $80 million. It also questioned whether he had made good on his philanthropic commitments and, according to the lawsuit, began spreading rumors that his finances were shaky. At the same time, the board approved two other buyers with arguably less desirable financial credentials, the suit claims. In 2004, to mark the 50th anniversary of Brown v. Board of Education, the Supreme Court ruling that declared segregation in schools unconstitutional, Mr. Fletcher pledged $50 million to institutions and individuals working to improve race relations. He has donated $4.5 million to Harvard to endow the Alphonse Fletcher Sr. Professorship, a position held by Henry Louis Gates Jr. Apart from a few hundred thousand dollars a year Mr. Fletcher gives in charitable stipends, it is unknown how much more of the $50 million he has donated." After Mr. Fletcher’s contract was rejected by the Dakota, Pamela Lovinger, who owns an apartment on the other side of Ms. Smith’s, stepped down from the board. Ms. Lovinger then put her apartment up for sale, offering it as a package deal with Ms. Smith’s former apartment for $19.5 million. A message left at Ms. Lovinger’s home was not returned Tuesday evening. The Dakota apartment building yesterday filed a 237-page response in New York State Supreme Court that denied charges of racial discrimination by a former president of its co-op board and claimed that he "simply lacked the wealth he claimed," according to an article in the February 16, 2011 edition of The New York Times by Chrstine Haughney and Peter Lattman. The former president, Alphonse Fletcher Jr., who still lives at the Dakota, sued its board this month, claiming he had been denied permission to buy an apartment next door because he was black and because another board member wanted the apartment sold in a package deal with her own. Mr. Fletcher also accused the board of discriminating against other residents or applicants, the article continued, "including the acting couple Melanie Griffith and Antonio Banderas, and the singer Roberta Flack, who, Mr. Fletcher said, had been forced to use the service elevator when walking her dogs while white residents were allowed to take their dogs into the main elevator." "Mr. Fletcher’s annual mortgage payments - he also owns two smaller units at the Dakota, at 1 West 72nd Street and bought his mother an apartment there in 2001 - are about $1.5 million," the article said, "yet his tax returns show his annual income is far less, the papers said. In 2008, Mr. Fletcher reported an adjusted gross income of $674,000. The board also was concerned that Mr. Fletcher supplied information through an accounting firm that appeared to be independent but was actually run by one of his employees. The response questioned whether Mr. Fletcher could afford another apartment when his total annual maintenance cost would rise to $228,873 and renovations would cost $1 million to $2 million."